Is it dangerous to start a post with a disclaimer? I’m not anti-American, there are many people, places & parts of the American culture that I love, but there are some aspects of their culture & the actions of some individuals/groups that I’d be opposed to. Just like there are aspects within humanity, my own culture, Christianity & even within my own life that I’ll call into question. I’m sad. It’s 2003 & I’m sitting in a church, in America. The speaker is excitedly retelling what he saw on TV the other night. The U.S have invaded Iraq, it seems to be on TV 24/7. What has him so excited is footage of some Iraqi tanks being obliterated, it is openly acknowledge that Iraqis died & this is a reason to celebrate! While there were cheers in a church in America, there were tears in a house in Iraq. This is why I’m sad. Should someone’s death be a cause of delight? 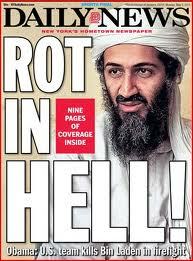 Fast forward to the outpouring of celebration at Osama bin Laden’s death. A country club sign reads, “Bin Laden Killed Party – free Beer/Pizza”. 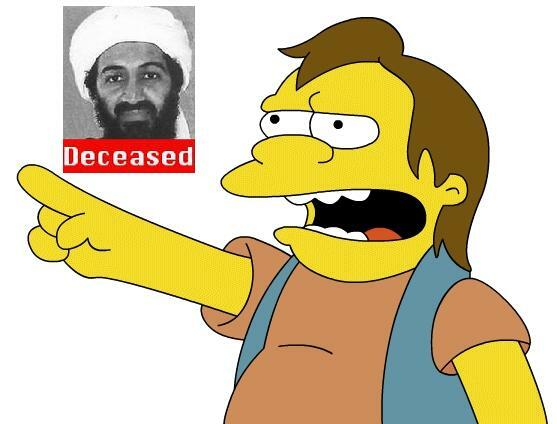 Have you ordered your Bin Laden’s dead t-shirt? There’s quite the range. “I mourn the loss of thousands of precious lives, but I will not rejoice in the death of one, not even an enemy. Returning hate for hate multiplies hate, adding deeper darkness to a night already devoid of stars. Darkness cannot drive out darkness: only light can do that. Hate cannot drive out hate: only love can do that”. I’m not interested in the legitimacy of the quote (omit the first sentence & the rest can be found in Strength of Love, pg 53 from a 1957 sermon on loving your enemies), if anything the rapid spread of the quote shows how much it echoed people’s sentiment. side note: In response to the above position there have been those who will point to texts on Justice & God’s love of it, I would caution how quickly the link between Americas actions = God’s justice, has been made, in some people’s minds it seems the American Military is the arm of God’s justice/judgement. Within our culture there is something unsaid, which says if you’ve been wronged you can do whatever you want to make it right. Take a look at our movies, the hero wronged in the beginning of the film leaves a trail of destruction & death as he seeks vengeance justice. Really, was shooting an unarmed man in the face justice? When in your mind you believe you have ‘Right’ on your side, then any action of revenge you take, no matter how violent, is satisfying, is seen as Justice…. I’m not surprised at the delight in Osama’s death, it’s a part of who we all are as humans. Schadenfreude – To take delight, satisfaction or pleasure in another’s misfortune. If celebrating death is at the top of a schadenfreude list, then its only a progression of what we do everyday… to take delight in someone elses misfortune. Our entertainment is geared to it, Wipeout, funniest home video’s, Reality TV, those FAIL! pics, any 1st episode of “… idol” or “… got talent”, on & on…. And I’m not innocent in this matter, I’ve laughed hysterically at many youtube links sent my way, and why…. why are other’s failure or misfortune funny to us? There are a few reasons, psychologist would say the main one is “positive self-evaluation”, we feel better about ourselves, we can laugh at that silly person who we are not like, we are better than them. Which brings me back to Martin Luther King Jr, because if we just stop at facebook quotes all we are really doing is saying I’m better than “those who are delighting in Osama’s death”, my quote shows I’m different. But are we, if we delight in others misfortune everyday? If scripture says we shouldn’t delight in our enemies misfortune & Jesus points to a higher way (Sermon on the Mount), then how much more relevant is it for those who aren’t our enemies, should we be delighting in their misfortune? I know I need to check myself.